Elisif the Fair is the Nord Jarl of Solitude. She is the widow of High King Torygg, and rumors abound that she may take the reins of power in Skyrim herself. Elisif does not believe the time is quite right yet to formally declare her intentions, but does believe that becoming High Queen of Skyrim is her rightful place. She has misgivings about entrusting the war effort to General Tullius, but doesn't see any other option. She is popular amongst her people, although some of her supporters have concerns about her age and inexperience. Because of her inexperience, she can be quite overzealous in her desire to protect her people, with little regard for public resources. For example, when you first enter the Blue Palace, she can be seen promising a concerned citizen that she will send an entire detachment of soldiers to inspect a cave from which "strange noises" were reportedly coming. Her court advises her to instead send only one or two scouts, and to preserve their resources until they know exactly what they are up against. She wears the unique fine raiment with a pair of unique cuffed boots and a copper and ruby circlet. She also carries a belted tunic, at least twenty-eight gold, and an assortment of upper-class items, food and gold. Elisif starts her day at 6am by getting up from bed to attend to her court. Her early court duties will be interrupted after just an hour, as the Jarl will break for a meal for the next hour of her day. From 8am to 12pm, she will return to managing the morning's court affairs. Once midday arrives, she will take an opportunity to visit her quarters for lunch for the next hour, afterwards continuing her court duties until 10pm. After the court closes for the night, she will retire to her room for the rest of the evening. Elisif may wander, eat, idle, or go to bed early, from 10pm to 12am, but she will always go to her bed by midnight to sleep. After at least six hours of sleep, the Jarl will wake up to repeat her schedule once more. Approaching the Jarl will have her direct you to speak to her steward before herself: "If you have business, please see Falk Firebeard, my steward." She may also comment on her tragic succession to the Jarldom before directing you to see her steward again: "With the passing of my dear husband Torygg, the weighty position of Jarl has fallen to me. Please direct questions to my Steward." She will also regularly speak out against Ulfric Stormcloak: "Ulfric is a fool and a coward, who naively believes he can bring about peace through warfare. It's rather sad, really." She will also make mentions of the tragedies brought on by his rebellion: "Thanks to Ulfric's rebellion, countless innocent people can't feed or clothe their families. It's unacceptably tragic." Conversation with Elisif will allow you to ask her about her claim to being High Queen of Skyrim, Ulfric's slaying of High King Torygg, and if she trusts General Tullius. Asking about her claim to the throne of Skyrim will have her explain that she cannot assume the role of High Queen until the Stormcloaks are defeated: "Not yet, no. Although it is true my husband Torygg was the High King, and I am his widow... now is not the time to lay claim to such a title. This land is riven by war, and her people suffer for it. The Stormcloaks are a blight on Skyrim, and like any blight... must be purged. Only then will I take my rightful place as High Queen." Questioning her why Ulfric killed her husband will have her respond by saying: "Because that's what traitorous cowards do when they desire power. Ulfric coveted the High King's throne. He thought he deserved it more than Torygg. And so he came before my husband and he... he shouted. With that terrible voice. Like something out of a legend... Or a nightmare. When Ulfric unleashed such fury, my husband he... he simply ceased to be. That is all I will say, for it grieves me to speak of it." Asking her if she trusts General Tullius will have her express confidence in the Imperial General: "Hmmm... A question I am all to familiar with. One my very Thanes ask often. They worry that Tullius is so focused on the war, that he risks forgetting what's best for our people. The real irony is that, while General Tullius is certainly no Nord, the people of Skyrim would be lost without him. Trust is always difficult, especially for my people. Yet we must trust in Tullius' leadership. For what other choice do we have?" If the Stormcloaks are victorious over the Imperial Legion, Elisif will have much grimmer comments about her claim to Skyrim, and Ulfric's duel with her husband. Asking her if she still acknowledges her claim to the throne now that Ulfric Stormcloak has won the Civil War, will have her admit that she will never be High Queen now: "No. Although it's true my husband Torygg was the High King and I am his widow, I am in no position to claim such a title. Ulfric Stormcloak is victorious, and the Jarls have fallen in line. It seems I will never take my rightful place as High Queen." Questioning her about her opinion on Ulfric now that she has been forced to submit to his rule will have her sadly lament on her husband's death: "Ulfric coveted the High King's throne. He thought he deserved it more than Torygg. Now it would seem Ulfric has his wish. And there truly is no justice in the world." After ending a discussion with Elisif, she may say: "Be well. Pray for Solitude and my husband." While the Imperials still control Solitude, she may also express confidence in Tullius: "Keep the faith. General Tullius will win this war." 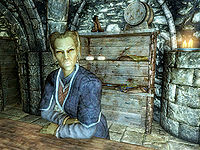 However, if Ulfric Stormcloak has forced her to submit to his rule, she will change her tune to reflect this: "We have the utmost confidence in you and Ulfric's guiding hands." Likewise, she will either express her faith in either The Eight Divines if the Imperials still hold Solitude, or she will acknowledge the divinity of Talos if the Stormcloaks control her hold: "May the blessings of the Eight/Nine be with you." Upon your first visit to the court in the Blue Palace while it is in session will have a farmer from Dragon Bridge, Varnius Junius, claiming of strange sounds originating from Wolfskull Cave. Elisif wholeheatedly accepts the report as being trouble for her lands, and will quickly pledge a legion to investigate and resolve the issue. In response to her hasty plan of action, the court wizard and steward will suggest that this is a non-issue and that a smaller response would be more appropriate. Having provided her instructions on the handling of this matter, Elisif will allow her steward to manage the remainder of the issue. Attempting to ask her about the issue with Wolfskull Cave will have her point you towards her steward: "Oh, I thought that matter was handled. I think Falk is taking care of that." After the completion of The Man Who Cried Wolf, Elisif will put some trust into you and will trust you with a more personal task to handle. Approaching the Jarl will have her comment on her need for your assistance: "There's something... personal... I was hoping you would do for me." Asking her what she needs will have her explain her issue: "Falk told me what you did for us at Wolfskull cave. He says you're someone we can trust. As you may know Talos worship is outlawed in the Empire. When we buried my husband I made offerings to all the gods... except Talos. I would like you to take an item of his, a warhorn handed down from his father, and place it at a Shrine of Talos." Asking her if she is a worshiper of Talos herself will have her explain that this is solely an act done out of respect for her husband: "No but my husband Torygg would want a proper burial and this is the way Nords are buried in Skyrim." Refusing the quest for the time will have her understand your decision, and offer it to you at any later time it is convenient: "That's all right. Return to me if you change your mind though." Asking her after already being told about the job will have her explain what needs to be done once more: "Yes, when we buried my husband I wasn't able to make an offering to Talos. I was hoping you would to take something of his, a warhorn handed down from his father, and place it at a Shrine of Talos." Accepting the task at any point in time will have her thank you and send you on your way with the horn: "Thank you. It would mean a lot to me." After facing an ambush from Thalmor forces led by Agent Lorcalin, and successfully placing the horn on the altar, you can return to Elisif the Fair for your reward. To show her appreciation for all that you have done, Elisif will have thank you and llow you to take the steps towards becoming a Thane, and the opportunity to buy Proudspire Manor: "Falk said I could count on you. You have more than earned the right to purchase property and take the next step to becoming a Thane. Speak to Falk when you have the funds. And thank you." Running into Taarie, the owner of Radiant Raiment, in the streets of Solitude will have her harshly criticize your personal appearance if you intend on visiting the court: "If you're heading to the Blue Palace, you might want to rethink that outfit." Asking her for what she would recommend for such an occasion will have her propose a mutually beneficial business deal: "You're really going to the Blue Palace? That presents an opportunity. If you were willing to wear one of Radiant Raiment's outfits and speak to the Jarl I would not only pay you but let you keep the outfit." Accepting will have her say: "Good. Here's the outfit. Try to get Elisif's opinion on it and if she likes it mention it's from Radiant Raiment." Rejecting her proposal, claiming a fear that she will make you look silly, will have her scoff at you and end the conversation: "Look silly! As if you could look any sillier than you do now." If you accepted the proposition from Taarie, speaking to Elisif while wearing the designated outfit will allow you to ask Elisif if she likes your outfit, to which she will respond: "It's quite fetching actually. The craftsmanship is excellent." Telling her that you procured the clothing from Radiant Raiment will have her respond that she intends to put in a request with the store in the near future: "Oh really? Well you can tell them that I will be putting in a request for a few dresses quite soon." Returning to Taarie, having modeled the outfit to the Jarl successfully, will have the Altmer thank you for your service, and give you a reward for a job well done. Elisif will be present at the ceasefire negotiations held between the Empire and the Stormcloaks during the events of Season Unending, as a representative of the Imperial delegation. Speaking to the Jarl after both parties have arrived at High Hrothgar will have her voice her continued disdain towards Ulfric for the murder of her husband: "I'm here because it's required of me. But there's nothing to be gained by talking to that murderer." She will also express a lack of faith in any progress being made towards a peace agreement: "I understand this council was your idea, Dragonborn. I'm afraid I don't hold out much hope for success." Ulfric: "We want control of Markarth. That's our price for agreeing to a truce." Elisif: "So that's why you're here, Ulfric? You dare to insult the Greybeards by using this council to advance your own position?" Tullius: "Jarl Elisif, I'll handle this." Elisif: "General, this is outrageous! You can't be taking this demand seriously! I thought we were here to discuss a truce!" Tullius: "(to Elisif) Elisif! I said I'd handle it. (to Ulfric) Ulfric, you can't seriously expect us to give up Markarth at the negotiating table. You hope to gain in council what you've been unable to take in battle, is that it?" Ulfric: "We've taken it before. I'm only asking for what will be ours soon enough anyway." Arngeir: "I'm sure Jarl Ulfric does not expect something for nothing." Rikke: "Yes, that'd be entirely out of character." Elisif: "Wait. General, you don't intend to just hand over Markarth to that... traitor!" Balgruuf the Greater (if present): "This is how the Empire repays us for our loyalty?" Vignar (if present): "You lost the trust of the people of Skyrim, Elisif. You had your chance to make the right choice when the war started." Tullius: "Enough! (to Ulfric) First, let's be clear. This council wasn't my idea. I think it's a waste of time. You are a traitor to the Empire, and deserve a traitor's death. But I at least will negotiate in good faith." Ulfric (if terms favored the Empire): "I shouldn't agree to terms that so blatantly favor the Empire. I have no choice, though, under the circumstances. But once Alduin is defeated - then it will be the Empire's turn. Remember - "Evgir Unslaad." You should be pleased, Elisif. You've done well for yourself as the Empire's pet Jarl. But beware - the Empire's loyalty is fickle. They will tire of this war, and then I will be the one dictating terms to you." 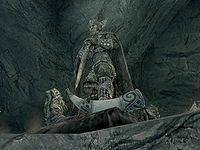 (if terms favored Stormcloaks or were balanced): "The sons of Skyrim will live up to their agreements. As long as the Imperials hold to theirs. What about you, Elisif? Are these terms to your liking? Speak up. I'm sure General Tullius is waiting to do your bidding." Elisif: " (to Ulfric) I have nothing to say to that murderer. (to Tullius) General, you've proven yourself a good friend to Skyrim. I continue to trust that you will do your utmost to safeguard our interests. Tullius: " (to Elisif) Thank you, Jarl Elisif. I appreciate your loyalty. (to Ulfric if terms favored Stormcloaks) These terms blatantly favor the rebels. Everyone here knows that. But the Empire will accept them, until the dragon menace is dealt with. After that, Ulfric... there will be a reckoning. Count on it." (if terms favored the Empire or were balanced): "The Empire can live with these terms, yes. For a temporary truce, until the dragon menace is dealt with. After that, Ulfric... there will be a reckoning. Count on it." Once the negotiations are done, speaking to Elisif will have her express her fear that Ulfric will betray the peace agreement as soon as it is favorable for him: "I'm glad you were able to negotiate a truce, but I don't trust Ulfric. He'll break his word as soon as it suits him." If you favored the Stormcloaks in the concessions made, she will also express her anger at any notion of him being victorious: "I don't know why you gave Ulfric so much. That murderer will never rule Skyrim." Elisif will have a variety of discussions with the various members of her court about the matters of state. 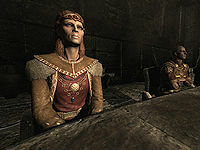 During one she will ask Thane Erikur for advice on handling the income lost during the war, only for Thane Bryling to interject that their support for the Imperial legion may be helping the Stormcloaks more than it is hindering their cause. Another occasion will have Elisif ask Bryling for a report on the defenses of the Haafingar, with Erikur interrupting the conversation to insert his opinion. Erikur: "My dear Bryling. Barring any... fancy and folly... the good people of Haafingar are surely capable of dealing with the odd highwayman or stray dog. " Jarl Elisif will also ask her steward, Falk Firebeard, about her next meeting with General Tullius. The Jarl will also show concern about the possibility of the city falling under siege, and asks her steward to prepare for the worst. Housecarl Bolgeir will protest General Tullius conscripting the local guardsman to his liege. Jarl Elisif will also propose a military parade to her court to boost the public's morale, to the disapproval of her steward due to it tying up the military forces and her Housecarl due making her vulnerable to an attack by assassins. A conversation between Steward Falk Firebeard and Court Wizard Sybille Stentor will show that Sybille has little confidence in Elisif's future. Erikur will bring up his concern about a new tax on naval shipping to Falk Firebeard, while also criticizing Elisif's treatment of the noble class. Elisif is the only jarl in Skyrim who cannot be replaced through the Civil War quests, regardless of your decisions. Elisif the Fair will speak a hard line against Ulfric, but a script note for her reveals a different outlook on the man: "Everyone expects me to hate Ulfric, but I truly don't. I just wish he would see reason and end this rebellion." 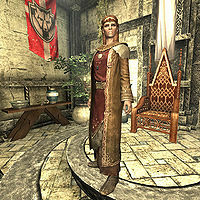 Jarl Elisif was originally Lady Elisif, and intended to be the target of a murder ordered by Boethiah, called Boethiah's Bidding, following the quest Boethiah's Calling. The quest itself was not implemented in the final game, but the data can still be found in the game files. Unused dialogue indicates that Erikur would have taken her place as Jarl of Solitude. During the quest Bound Until Death, Jarl Elisif will not be in the Blue Palace as she is at the wedding. Elisif also leaves the Blue Palace to attend the Burning of King Olaf festival. 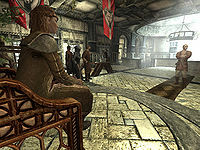 Elisif is among the Imperial delegation during the peace council at High Hrothgar. Elisif is the only jarl that does not slouch in her chair while holding court. She is a member of the citizen class, which determines the level of her skills. This page was last modified on 14 August 2017, at 04:00.